The Falmouth Commodores’ dominant right-hander Jeffrey Passantino received the B.F.C. Whitehouse Award on Friday evening, crowning him the most outstanding pitcher in the Cape Cod Baseball League. He is the first Falmouth player to receive this award since Tim Norton in 2005. Passantino has a strong build standing 5’10” and weighing 210 pounds. This right handed pitcher is from Cape Coral, Florida and made it to the Cape League by way of his superior playing at Lipscomb University. Passantino played for the Lipscomb Bisons during the 2015 and 2016 seasons. In 2015, Passantino’s excellence on the mound was rewarded when he received the following accolades: 2015 Louisville Slugger Freshman All-American, 2015 Atlantic-Sun Second Team All-Conference, 2015 Atlantic-Sun All-Freshman Team, and a two time Atlantic-Sun Pitcher of the Week. That season he played in 16 games as a freshman, boasting a record of 5-1 with a 2.69 ERA (the second lowest on the team). Over the course of 67 innings pitched, Passantino struck out 64 and gave up a meager 14 walks. Most notably during the 2015 season, Passantino threw 19 consecutive scoreless innings, falling two short of the schools record (21). Passantino continued his greatness at Lipscomb in 2016 playing in 15 games and ending the season with a 6-5 record. During the season he pitched 98 innings, striking out 82, and walking only 12 batters. During the 2016 Cape League season Passantino continuously showed his exceptional pitching abilities. Passantino finished the regular season with a 3-0 record, pitching 42 innings over the course of seven games. He held an ERA of 0.64, which was number one in the league, and struck out 39 batters (second in West Division), while only giving up three walks. His success did not go unnoticed by the Cape League, as he was selected to be part of the West Division All-Star team. He pitched one perfect inning--giving up no walks or hits--and striking out one. Passantino really showcased his skills on July 4th during a game versus the Cotuit Kettleers. He pitched seven shutout innings, giving up only two hits, one walk, and striking out seven in Falmouth’s 2-0 victory over Cotuit. Passantino had another exceptional performance on July 29 playing against the Wareham Gatemen. In this game, he pitched six innings without letting in a single earned run and struck out six batters without allowing a walk. The Falmouth pitcher continued his dominance in the first round of the West Division playoffs. On August 5, the No. 1 seeded Commodores faced the No. 4 seeded Hyannis Harbor Hawks at Arnie Allen Diamond at Guv Fuller Field in Falmouth. During Falmouth’s 6-0 victory over Hyannis, Passantino pitched six scoreless innings, allowing three hits, two walks, and striking out seven. The B.F.C. Whitehouse Award was named after a longtime supporter of the Cape League, and specifically the Harwich Mariners. 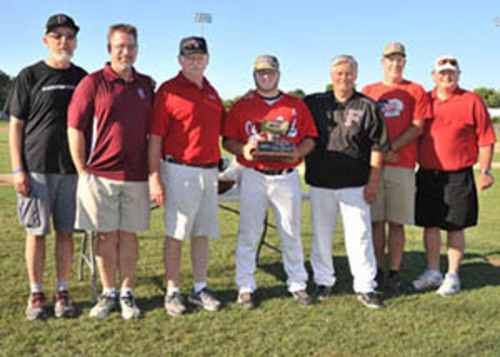 He raised thousands of dollars every year to help maintain the Harwich field and support the continuation of the team and league as a whole. As a result of his tireless and selfless efforts, the Mariners honored this man by naming their ballpark Whitehouse Field.